Your dog will love “going with” even more with these tips! Springtime is upon us and there’s no better time to go out exploring than now! We know it’s a little more exciting to go on adventures with friends… or furry friends! We also know that taking your pup in your car can get messy and it can be pretty distracting. Here are a few things you can do to make the ride better for yourself, and your pup! Be responsible and plan ahead. IWe all know how hot it can get here in California, and here in the springtime temperatures are rising. It is absolutely illegal to leave your pet in a car at dangerous temperatures. In addition, if someone sees your dog stuck in a dangerously hot car, it is now legal for them to break your window to help the pet. Just don’t leave your dog in the car. Plan ahead, if you need to make a stop then just leave pup at home, or leave a passenger in the car with them to keep them cool and safe. Dogs are the cutest passengers to have, but also some of the messiest. There’s no escaping it, if your pup gets in your car, he’s going to leave a little bit of fur behind. You can take measures to minimize the amount left behind though! Try looking into some seat covers that you can take out and shake out/throw in the laundry in between rides. If you don’t think you can afford seat covers at the moment, no need to worry. You can always just use a blanket the same way, cleaning between rides. Another obvious clue that Fido has been in the car are disgusting/cute nose marks he leaves on your windows. A simple way to prevent this is just using plastic wrap to cover the windows. You will still be able to see out of them while driving, but after the ride is over you can just remove the plastic wrap and throw it in the trash. Easy as that! Your pup might like to move around a lot on his day out on the road, and he might even try to climb in your lap. Depending on his size, this could be a huge hazard. For both of your safety, and to keep you from getting distracted, we recommend making a dedicated space for him in the car and securing him with a harness. A safe pup is a happy one! 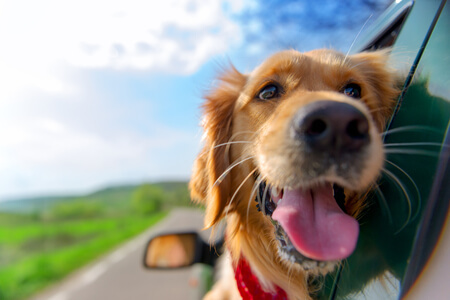 Here at West Automotive Group, we love and adore our pets and like to bring them along for adventures. We hope our tips for doggie travel can help you and yours have a tail-wagging time on the road!